So you’re thinking about buying backlinks? Before you do that, you’d better know what you’re getting into. I’ll break it all down for you in this article. It might seem like a quick win to get a few dozen backlinks from a savvy SEO who’s built a private blog network (PBN). Or maybe you are going to build a bunch of profiles and add links in them to your website. Trust me, I have seen it all! But in SEO, if you don’t really earn your rankings, there is a good chance they are only temporary. You will get a penalty, get kicked out the index and be in a world of hurt regarding your online revenue/leads. Here’s what you need to know about buying backlinks. The first thing that you should know is that buying backlinks violates Google’s Webmaster Guidelines. That should be a good enough reason to make you reconsider. In a nutshell, any attempt to manipulate search engines is a violation of the guidelines. That’s why you should avoid doing so unless you want to earn the wrath of the Big G.
Keep all of that in mind as you read on. What Does It Mean to Buy Backlinks? Some SEOs are willing to gamble with their reputations. That’s why they purchase backlinks from people who’ve created their own PBNs. What makes PBNs such prime digital real estate? They’re usually built from domains that have been around for a number of years and, in some cases, have created a reputable online presence. 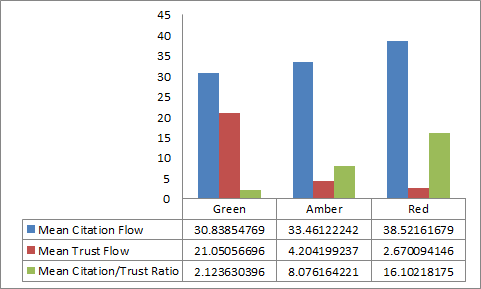 It’s not uncommon to find domains in a PBN that have a Trust Flow (TF) north of 20 and a Citation Flow (CF) north of 25. Those are OK numbers and can help any site rank well. The problem is that they exist solely to help sites rank well. Google doesn’t like that because the company wants to index information that’s actually useful to its users as opposed to indexing pages that do little more than host backlinks. Webmasters who own PBNs engage in covert activity. They have to conceal their network from prying eyes. As a result, they prevent bots from companies like Ahrefs and Majestic from crawling their sites. That way, their clients’ competitors can’t see what they’re doing. It’s all pretty clever, but the clients of those PBN owners put an awful lot of faith in their ability to cover their tracks. If, for whatever reason, those tracks aren’t covered very well, then those PBNs might get discovered and all of their backlinks will be worthless. Keep in mind also that the way that PBN owners block bots from crawling their site is by updating the robots.txt file. But there’s no written law that says any company has to obey what’s in the robots.txt file! Even worse, bots can see what’s in the robots.txt file. If it looks like the site is blocking a lot of bots from crawling, that might in and of itself be a sign to Google that the site is shady. If Google does determine that the site is link-spam haven, then expect the backlinks on the site to become worthless. People who own PBNs aren’t running a charity. You’re going to have to pay for your backlinks. How much will you pay? That depends on the reputation of the PBN owner and whether or not you’ve got your hands on a discount code. In general, expect to spend a couple of hundred bucks for about 1 to 5 backlinks. Each backlink will come from a different domain on the PBN. In exchange for the money, you’ll often get absolutely no evidence that the links you purchased are live anywhere. Why? Remember, PBN owners hide their sites. So instead of getting a list of pages with backlinks, you’ll just get a list of domains that include your links with TF/CF info for each domain. So, once again, you’re operating on trust. Another reason to avoid PBNs and buying backlinks: it’s often the case that they’re run by one person who has very little free time. As a result, the PBN webmaster “creates” content for you by just spinning existing content on the web. If you’re not familiar with the concept of “spinning,” it’s a way that some blackhat enthusiasts take content that’s already online and use software to paraphrase it. That’s how they avoid duplicate content penalties. The problem is that spinning software isn’t anywhere near perfect. It’s often the case that spun content looks like something written by a child in Kindergarten. If Google detects poor grammar in the article that links back to your site, you can bet it will devalue the link. When that happens, you won’t get anything for the money you spent. Webmasters who host PBNs are also notorious for using shortform content. A backlink you buy will often end up in an article that only has about 300-350 words. In other words, PBN owners do just enough to get you a little bit of link juice. That doesn’t look authentic, and it probably isn’t going to fool Google for much longer. Keep in mind that you’ll see much better SEO benefits with longform content, which is rarely offered when you purchase backlinks. As we’ve seen, you can spend a lot of money when you buy backlinks. In addition to that cost, though, you could pay dearly when Google discovers what you’ve done. Sites have been penalized for buying backlinks (tons of sites). Over at IT Digital World, Tirtha Ohja tells a horror story about what happened after he bought backlinks. At first, he writes, everything looked great. His website traffic increased 200%. That lasted all of two days. Afterward, the site not only lost its new and improved rank but its old rank as well. “[A]fter few hours of research I found my site was penalized by Google for buying backlinks,” he writes. To fix things, he had to disavow the spammy backlinks. Ohja wrote that article in 2015, when Google handled penalties differently than it does now. Back then, Google penalized sites that used spammy backlinks. Webmasters who were penalized had to disavow the bad backlinks to get back up and running under “normal” conditions again. That’s not the way it is any more (in many cases, anyway). Now, instead of penalizing a site, Google just devalues the backlink itself. That means you’ll be wasting money if Google catches on to that PBN you think is a great source for a backlink profile. But it’s not likely that your site will be put under a manual review. Still, why spend money on something that eventually could be worth absolutely nothing? If Google does devalue those links, you’ll have wasted your investment. Here is the thing about buying backlinks today. This could all change in a second. In fact, I believe Google will eventually stop devaluing backlinks and instead start imposing Penguin-like penalties or manual actions on websites again. So you need to watch out for this. How does Google know if you paid for backlinks instead of earning them organically? There are a few ways. We’ve already touched on a couple of ways that Google can determine if you are buying backlinks. First, it can see if the website is trying to cover its tracks digitally. Second, it might pick up on the spun content. There are other ways that Google knows, though. Also, if you go cheap and pay for backlinks from low-quality websites, Google will quickly determine that they’re probably spam. Moreover, you can be sure that the folks at Google are monitoring the black hat sites to learn about people selling backlinks. If you can find a vendor that’s selling backlinks, so can Google. Finally, Google sees how things are linking to each other on web. If there is some irregular linking going on, common to sites that sell backlinks, Google knows. And you can be sure that Google is on top of that situation. Now that we’ve covered several of the “thou shalt not,” it’s time to offer some pointers about how you can build a healthy backlink profile the right way. First, go with guest posting. The trick there is to find someone who runs a non-competing blog and ask that person if you can guest post on his or her website. When you do post an article on someone else’s website, you’ll, of course, link back to your own website. That’s perfectly legal. Just remember to make sure that your backlink is natural. Otherwise, Google will smell a rat. In other words, if you’re writing an article about horseback riding, make sure that you link back to a part of your site that’s relevant to horseback riding. That will make sense to the Google algorithm. Do not force it, only do it if it makes sense. Also, practice good karma with guest posting. In other words, if someone is kind enough to let you post on his or her blog, return the favor and allow that person to post on your blog. Keep in mind that guest posting is a win-win situation for everybody. The blog owner gets some much-needed content and the guest poster gets a backlink to his or her site. That’s why guest posting is one of the best ways to build backlinks. Check out our 10 chapter guide to building backlinks for SEO. Click on the image below or this link. Also, earn backlinks by producing some irresistible content with clickbait headlines. Those kinds of posts will earn you backlinks not only on other websites, but also shares on different social media channels. You’ll have people flocking to your site and you’ll generate buzz about your brand. Along those lines, use digital marketing tools to determine what type of content earns you the most backlinks. Then, create more of that content so that you’re likely to get even more backlinks. Another option: pick up a tool like SEMRush or SpyFu to evaluate the backlinks of your competitors’ sites. Armed with that information, reach out to some of the webmasters that are hosting backlinks to competing sites and ask for an opportunity to guest post. Finally, grab some “low-hanging fruit” when it comes to backlinks. There are plenty of opportunities out there that won’t cost you a penny. For example, if you’ve got a Tumblr account, post some valuable content there and link back to your site. Remember, though, keep the content relevant. Also, look for sites that welcome backlinks relevant to your niche. For example, N4G is an excellent site devoted to gaming that not only accepts, but encourages, backlinks. If you have a site or post that’s relevant to gaming, post your link on N4G. It’s dangerous to buy backlinks. There are also many other ways to buy backlinks than I listed in this article. I just wanted to focus on the most prevalent methods. What I would say to you, is instead of taking the easy way out, work to build a healthy backlink profile by following Google’s Webmaster Guidelines. It is really the right way to do it and it will result in more longevity. Finally, Google is moving away from using backlinks as a ranking factor anyway. So focus on your content and user experience instead.